When it comes to gambling on Bitcoins, we can say that 1xBit is one of the few brands in the industry where the anonymity and confidentiality of customers are valued from the very beginning. At the same time, 1xBit does an amazing job, providing quality service and almost all gambling options at once in one place. The 1xBit website offers an impressive portfolio of top rated casino games from leading providers along with a modern bookmaker office. It is worth mentioning that if desired, players can also try their hand at trading on Forex, virtual sports and other casual games on the site. The 1xBit site mainly focuses on Bitcoin players, since at the moment this cryptocurrency is the only option to replenish the game balance with funds. Despite this, 1xBit has a gaming license issued by the Government of Curaçao, therefore all activities on the website are regulated and protected. Nevertheless, it seemed to us that the brand has room to develop, for example, we noticed that the navigation system can be improved to provide faster and more convenient service for its customers. Let’s look at all the sections on the site that may be extremely useful to you, and also consider exactly what advantages of the site you can take. However, when you log in with your game account and decide to explore the site in more detail, you may experience some difficulties with navigation, which needs to be improved. In the upper left corner you can get access to your personal account, replenish your account with a deposit and keep track of your points, and in the opposite corner are all the settings related to the web site and personal account. Perhaps they should have combined all this information and kept it in one place. In addition, the top menu displays absolutely everything a player can do on the 1xBit website. In fairness, it should be noted that this approach creates a certain overload of information, especially for new users. Instead of having more than 10 menu items, it would be more logical to divide the site into several categories, for example, sports, casinos, trading, promotions and so on – this would create a clear navigation and help the user figure out exactly where he is and wants to be . By placing bets in casino games on 1xbit, you will receive special loyalty points that can be exchanged for cash or spent in various bonus programs at any time convenient for you. 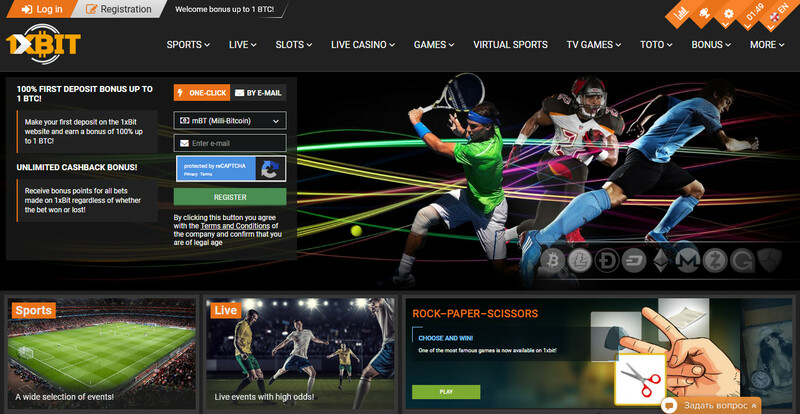 As you can see for yourself, the 1xBit website offers more bonuses for the sports bookmaker office than for the casino, and this is another point where improvements may be needed. Each of the offered bonuses has certain conditions, additional information on which can be found on the page of bonuses. As mentioned at the outset, the 1xBit gaming platform provides the only payment method – Bitcoin. Thus, in order to replenish the balance of your gaming account and start playing at 1xbit, you need to go to the upper corner of the site and click on “Deposit”, as an alternative, you can do the same operation from your account section. You can make a bitcoin deposit through a desktop wallet, or through a mobile application. If you prefer to use a desktop or Internet wallet, then simply copy the address of 1xBit wallet details, where you need to send funds or scan the QR code via a mobile application, enter the desired amount and confirm the sending.